Install a lightning protection system – A lightning protection system supplies structural protection by providing a specified path on which lightning can travel. When a building is equipped with a lightning protection system, the destructive power of the lightning strike is directed safely into the ground, leaving the structure and its contents undamaged. The system includes a lightning rod or air terminals at the top of the house that can be disguised to look like a weather vane and wires to carry the current down to grounding rods at the bottom of the house. 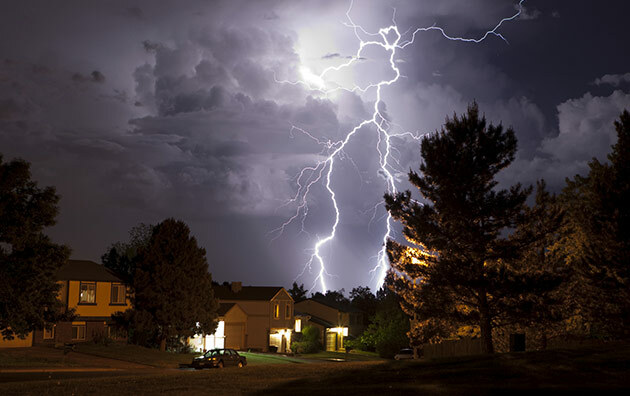 According to the Institute for Business & Home Safety (IBHS), the lightning protection system needs to be securely anchored to the roof; otherwise it may whip around in a storm and damage the building. So make sure to have a licensed electrician install your lightning rod and protection system. Use surge protectors – Today’s sensitive electronic equipment is particularly vulnerable to lightning. To assure the highest level of protection, UL-listed surge arrestors should be installed on electrical service panels. Installations typically include surge arrestors for the main electric panel, as well as incoming phone, cable, satellite and data lines. Surge arrestors protect against damaging electrical surges that can enter a structure via power transmission lines. By filtering and dissipating the harmful surges, arrestors prevent electrical fires and protect against electrical discharges that can damage a building’s electrical system, computers, appliances and other systems. UL-listed transient voltage surge suppressors can also be installed to protect specific pieces of electronic equipment. Keep in mind that power strips offer little protection from electrical power surges. Unplug expensive electronic equipment – As an added precaution, unplug expensive electronic equipment such as TVs, computers and the like if you know a storm is approaching.